The reported incidence of acute abdominal pain in pregnancy is 1/500-1/635. Despite initial concerns about the safety of laparoscopic surgery during pregnancy, there is an increasing body of evidence supporting its use in this scenario. Our objective was to review cases of acute abdominal pain in pregnancy which were managed laparoscopically at our institution to evaluate surgical and obstetrical outcomes. We were also interested in reviewing the peri-operative management of these patients to determine whether clinical practice is consistent with practice guidelines. We did a retrospective chart based review of all cases of acute abdominal pain in pregnancy that were managed laparoscopically between July 1 2003 – June 30 2005 at our institution. We identified 5 cases meeting these criteria in the given time frame. All 5 surgeries were successfully performed laparoscopically with no conversion to laparotomy. There were no reported uterine, bowel or vascular injuries, nor any obstetrical complications such as preterm labour or preterm rupture of membranes. All patients carried pregnancies to term and had vaginal deliveries. Peri-operative management of patients was variable. DVT prophylaxis and obstetrical consultation were not routine, and there were several different approaches to fetal and uterine monitoring. Our results are in agreement with the accumulating body of evidence demonstrating that operative laparoscopy performed by a skilled and trained laparoscopist is safe and effective during pregnancy. 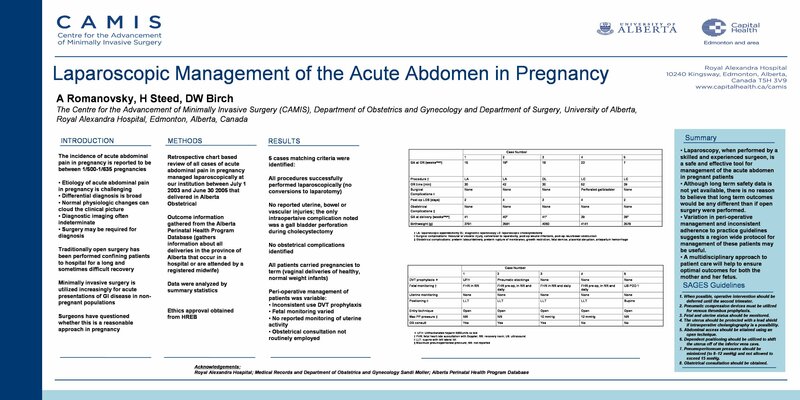 To optimize maternal and fetal outcome, adherence to established guidelines regarding peri-operative management of pregnant patients undergoing laparoscopic surgery is recommended.